← How Do Publishers Reach Readers? Sue Grimshaw Speaks! In my first blog on place descriptions, Place Descriptions: It’s about Atmosphere Not A Travel Log, I promised to deliver more place descriptions. Today’s list is about waterways, lakes, oceans, rivers, and seas. I was very tempted to list all kinds of boats and ships and marine life. I had to remind myself that this blog isn’t a research source. My lists serve two purposes. When it comes to waterways or any place description, don’t overlook descriptive verb choices. The great thing about descriptive verbs is their ability to eliminate wordy adjective and adverb phrases that make descriptions boring and clunky. When I’m not sure what kinds of descriptive verbs to use, I reach for a handy dandy book called The Word Finder by J. I Rodale. Look up for example, at the words, ocean, lake, river, and sea. The Word Finder lists adjectives, adverbs and verbs that describe a subject. In the case of waterways, I’d go a step further and look up marine life, ships, boats etc. And don’t forget poetry books for unusual descriptions. Use your creative noggin. Note: In some cases The Word Finder has become pricy. However at Amazon, I did find used copies. 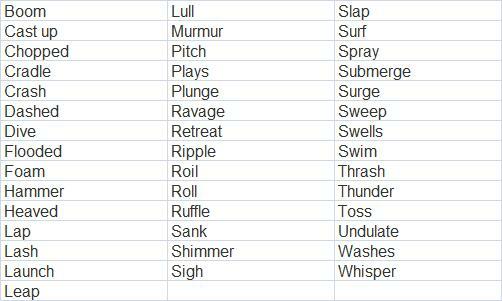 Verbs that may describe the sea: Find more in the phrase list below. Descriptions of waterways are not just about the water itself. They include surroundings and actions that take place in and around water. With this in mind, I compiled the following term and phrase list. Don’t forget that definitions are also descriptions. Whole books have been written with glossaries that define waterways, professions that utilize waterways, land near water, ships, marine life, and all the jargon that follows For that reason, I’m listing only a few definitions here as examples. For more ideas see the links below. A Sea Of Words, A Leicon and Companion for Patrick O’Brian’s Seafaring Tales by Dean King, with John B. HattenDorf and J. Worth Estes. An excellent reference on sea-faring, ships, sailors, equipment etc with most definitions applying yet today. Okay, your turn. Got any waterway descriptions or great places to find them? Share with the rest of us. This entry was posted in Miscellaneous and tagged descriptive verbs, descriptive writing, lake descriptions, ocean, ocean descriptions, place descriptions, river descriptions, sea descriptions, Sharla Rae, water, Waterway descriptons, Writers in the Storm, writing. Bookmark the permalink. Great post. Sometime this week I’m going to reach the part in my WIP where I have to describe the Neva River in St. Petersburg. It’s such a part of the city (like the canals in Venice) that it’s going to be tricky, but I’ll let you know if I come across any great resources. Great! I’m constantly adding ideas to all my lists! I’m saving all the descriptions – they’re wonderful! But the sparkling gem in this for me, was the reminder to use verbs to make descriptions fresh, and convey emotion – which is always more powerful than a simple description. We want to know how the scene impacts the character who sees it – if they’re afraid of water, the verb choice will be way different than someone who grew up on the water. Unless, they grew up on the water, and were afraid of it . . . .now THAT would be interesting! Holy cowbell, that would be awesome! Yes I agree! Using verbs to describe scenery is a little nugget of gold I have squirrelled away for future harvest. OMG! You rock! er… You wave! (grins). I’m saving the descriptions as well. I have a future book that deals with ocean travel. Great post. Thank you. Another great list, Shar! You know, your lists would probably sell like hotcakes on Amazon if you put them together in a book. Authors are always looking for good reference material, and your lists are terrific. Thanks Lyn. It’s a good idea! Yeah, I love the putting these posts together in a book idea. Good one! This really gave me food for thought Sharla. I haven’t used books or lists or travel brochures or anything like that for my scenery. I visualize the scene and then write what I see. Works for me. However there’s always room for improvement! Serendipity! Thank you, Sharla. My WIP takes place on the ocean. By the way, I always write with a battered copy of The Synonym Finder at my side. Sharla, this is a really excellent article. While I don’t have a waterway to describe at the moment, when i do I’m sure I’ll remember this. best wishes -R.S.